Fairwinds Treatment Center has been certified by LegitScript as we celebrate our 30th anniversary as a dually licensed facility for drug and alcohol treatment and eating disorders. The LegitScript seal of approval has been granted just as Fairwinds Treatment Center celebrates our 30th anniversary. When Dr. M.K. El-Yousef founded Fairwinds in November 1988, his goal was to establish a treatment facility of integrity with a commitment of excellent to the individuals struggling with addiction. 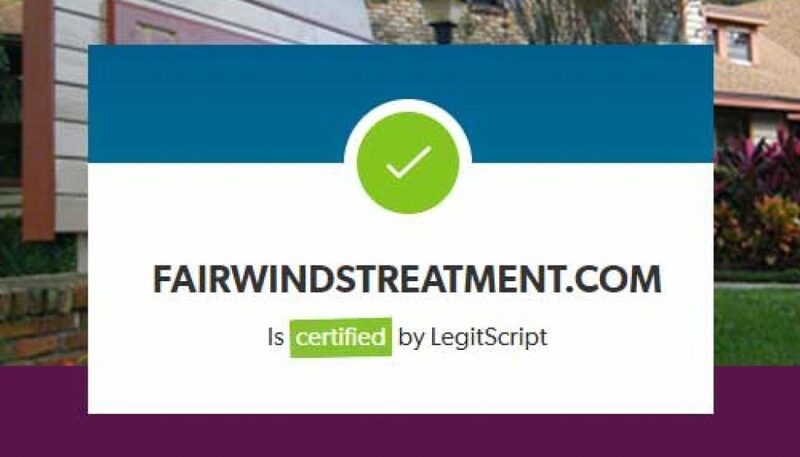 Fairwinds Treatment Center is proud to add the LegitScript certification to their list of accreditations including, The Joint Commission, AHCA and the Florida Department of Children & Families. Fairwinds Treatment Center is also in network with most major insurance providers, each with their own criteria and standards. Deciding to get treatment for substance abuse is a major milestone for most people who struggle with addiction. Fraudulent organizations that prey on those seeking help in desperate times not only affect these individuals and families in a negative way financially, but by diverting attention and resources away from legitimate treatment facilities, those who are struggling continue to struggle and, in some cases, become averse to seeking treatment again once they have been taken advantage of. Fairwinds Treatment Center is a dually licensed medical facility delivering highly personalized care with one of the highest staff-to-patient ratios in the industry. Our unique model for recovery combines individualized care with individual/group therapies so that our patients are exposed to a multi-faceted support network. Under the direction of Dr. M.K. El-Yousef, our staff of full-time psychiatrists, nursing professionals and licensed therapists work to first diagnose the underlying reason behind a person’s disorder. Upon understanding the root cause or causes, a personalized treatment plan for recovery is established. A lot has changed in the addiction treatment industry over the past 30 years. With online search and advertising being the method in which most families find treatment, separating legitimate treatment centers from predatory scammers such as lead generation providers who falsely advertise services has become extremely difficult for both consumers and search engines. In September 2017 Google took notice and began limiting advertisements for drug and alcohol rehab centers across the board and by January 2018 had completely stopped all advertising for this sector in both the US and UK. While most drug and alcohol treatment centers must maintain accreditation with governmental agencies, a special digital certification process was needed to help Google separate the good from the bad. Enter LegitScript. LegitScript had already established a certification process to help monitor online pharmaceutical companies and help to ensure consumers were not taken advantage of by spammers and predatory organizations. Google enlisted LegitScript to create a new certification process for drug and alcohol treatment facilities that shows they are a legitimate treatment facility along with background checks, standardized policies and procedures that fit certain guidelines and more. If a drug and alcohol treatment center plans to advertise their services through Google, the most used search engine in the US and UK, they need to be certified by LegitScript. For more information or to schedule an assessment or tour, contact Fairwinds Treatment Center here.